Food Poisoning. One does not have to eat some exotic Japanese dish of Scorpion fish to be struck down with food poisoning. It could be something you ate while traveling in a foreign country, but more and more it could be something you ate at a chain restaurant, at a church potluck, or even at your dining room table. Something you purchased at your local supermarket gave everyone a mild or severe case of vomiting and diarrhea. There was a food recall. Thousands got very sick, some hospitalized, some died. You were fortunate. But you could have dramatically increased your odds of not going from and upset stomach to retching if you had known to carryActivated Charcoal in your medicine cabinet, in your purse, in your car glove compartment, or in your travel luggage. Food and water born diseases are the single largest cause of death in the world. While activated charcoal may not help with all these diseases that are triggered by either contamination or microbes, charcoal should be the first aid treatment of choice, knowing that even if it does no good, it will not add to the problem. Even some dumb (?) animals know enough to eat charcoal for gastric upset from eating toxic plants. The Colobus monkey of Zanzibar knows that, after eating toxic mango and almond leaves, if it chases them down with common cooking charcoal (stolen from unsuspecting vendors) it eliminates any adverse side effects from the high protein leaves also high in plant toxins. In the early 1800's pharmacists demonstrated the high adsorption capacity of charcoal to adsorb arsenic and strychnine by drinking down a good amount of charcoal powder. They had already demonstrated with animals that charcoal quickly neutralized these poisons. But you don't have to dine on toxic mango leaves, or experiment with strychnine, to learn how fast charcoal can settle a sour stomach after an otherwise enjoyable meal. How much should you take? Some say you can't take too much. A standard hospital adult dose for poisoning is 50gm (5 tablespoons), so you can see the body can tolerate a lot of charcoal. Just be sure to mix it down with lots of water. Never ingest it dry! So, from now on, be one of those savvy world travelers who never go anywhere without charcoal within easy access, whether it is to Timbuktu or to Mom's for supper. Read more about charcoal's amazing properties. 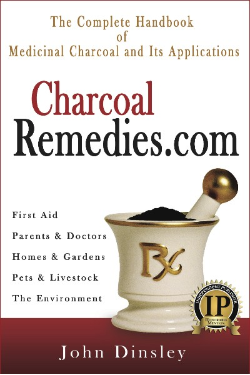 Get CharcoalRemedies.com The Complete HAndbook of Medicinal Charcoal & Its Applications.